William was born in Ashton Under Lyne in 1872 (not the East Indies), to John Basquil and Ellen Gillen. His story is a little bizarre, and the pieces don’t fit together easily, so there’s margin for error. However, I think I have it pieced together correctly, despite the strange anomalies. For a start, look at that 1886 apprenticeship paper. It states that his father was a soldier, killed in “Afghan,” and that his mother had deserted him. Neither of those things seems to be true. I can find no indication that John Basquil was ever in the military. He was still alive in the 1881 census, where his occupation was “grinder” in a factory. 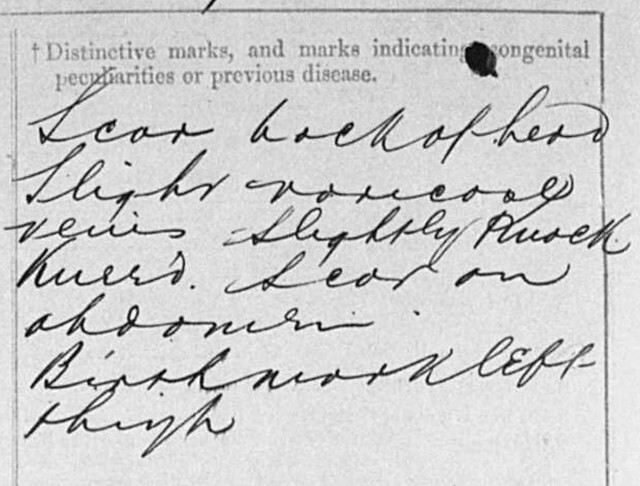 John died in 1890, so was not enumerated in 1891’s census. Ellen was, though. In 1891 she was living in Stockport with William and his younger sister, Mary. All three are working in a cotton factory. William’s mother, Ellen, died in 1894, in the Cheshire Workhouse. She was 44 years old. His sister, Mary, gave birth to a son named Thomas on 19 April 1896, also in the Cheshire Workhouse. He was illegitimate. She died in the workhouse on 2 May 1896, just a couple of weeks after giving birth. 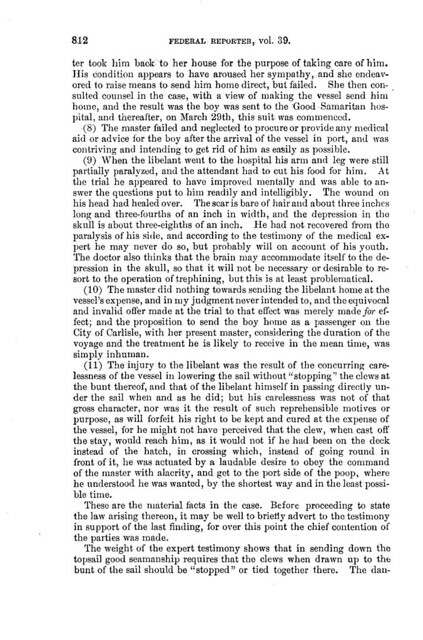 Orphaned Thomas managed to live for a year, dying 19 May 1897. Clearly, these folks were incredibly poor. I suspect that it was less a case of Ellen deserting her son as it was that she had no options and was forced to seek aid in the workhouse. William and Mary were likely left to fend for themselves, with the result that William ended up in the Boys’ Refuge in Manchester, and from there, apprenticed to the captain of the HMS Indefatigable. His apprenticeship began in 1886 and was to last for a term of three years. 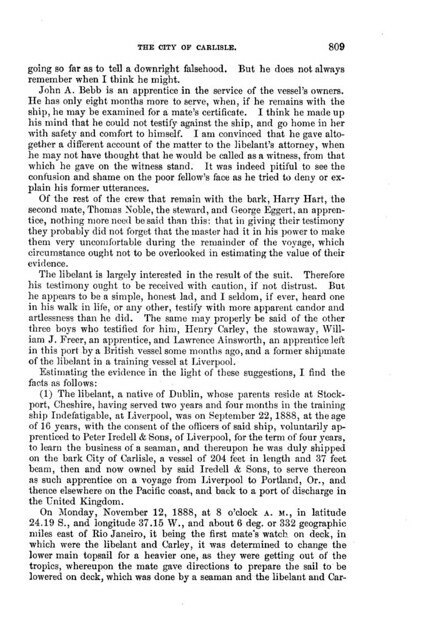 However in 1888, he deserted the Indefatigable to join the crew of the City of Carlisle, again as an apprentice. And that is where everything gets weird. The City of Carlisle was sailing to Portland, Oregon. 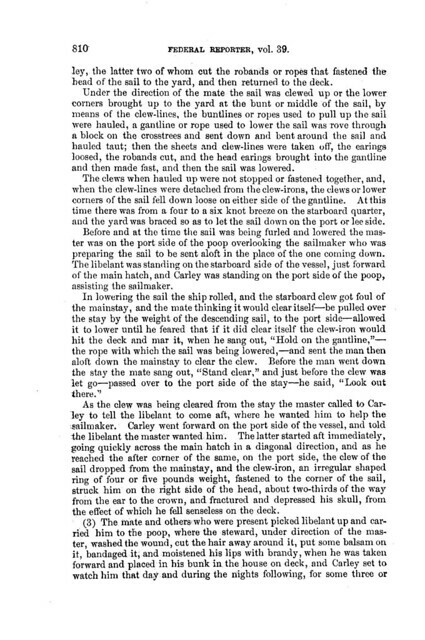 On 12 November 1888, off the coast of Rio de Janeiro, as the crew were lowering the sails, William was struck in the head with a clew iron. 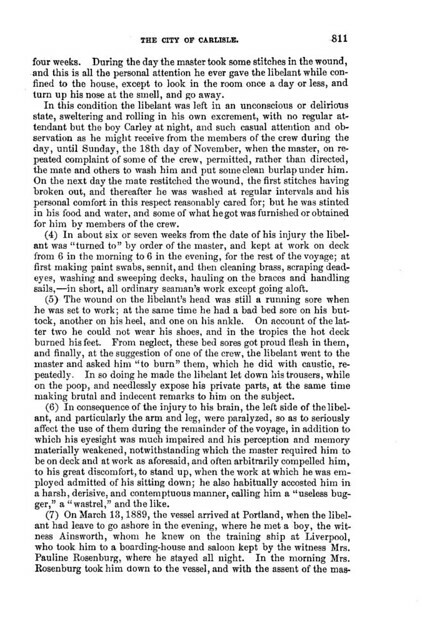 The injury was terrible, and William could well have died. And given the apparent lack of concern and aid from the ship’s captain, it’s miraculous that he didn’t. First, there are still some details that are incorrect. William is no more a native of Dublin than he is the East Indies. But at least here, his parents are described as living, and in Stockport, too, which is correct. And despite those inconsistencies, you can see that this is indeed “our” William. He served first on the Indefatigable, then later on the City of Carlisle. This is our guy. So he survived his ordeal, went to trial to sue the captain for gross negligence, won his case, and was awarded the sum of $1530. Not a huge amount of money, even then, as compensation for nearly dying, but I’m sure he was glad to have it. His story doesn’t end there, though. 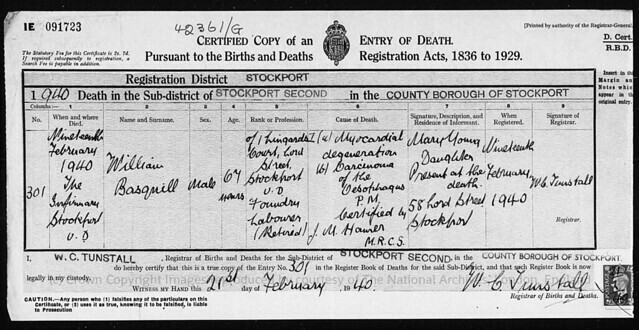 He returned to England, where he was enumerated in the 1891 census, living with his mother and sister, in Stockport. Later that year, he joined the British Army. He was discharged in 1903 and in 1904 he married Catherine Cohen (her second marriage). They had two children of their own (William and Mary). William re-enlisted in 1918 and again in 1919. The military stuff is interesting, because it ties some things together. 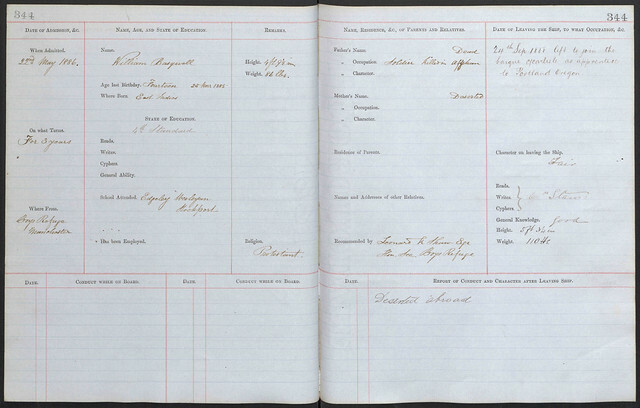 United Kingdom, “British Army Service Records 1914-1920,” William Basquill, short service attestation form signed 7 Oct 1891, Bury, England; digital images, Find My Past, Find My Past (www.findmypast.com/ : accessed 11 Mar 2017). This is indeed our William, and he’s had a hard life. He ultimately dies in 1940, at the age of 67, of myocardial degeneration and carcinoma of the oesophagus. All of that research, and this isn’t even a branch I can tie in to my own tree. Hmf.